West Bengal State Electricity Distribution Company Limited AE Exam Question Papers are available now to download. So the candidates who are preparing for the AE exam can check the WBSEDCL Previous Papers. 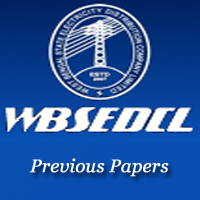 Free downloading links for the WBSEDCL AE Previous Papers are available below. Also, refer the West Bengal Electricity Distribution Company official website i.e. www.wbsedcl.in for more details about the Assistant Engineer examination. The candidates who are looking for the West Bengal State jobs are already applied for the Assistant Engineer jobs. If you are one among the West Bengal job seekers, then utilize this great opportunity. Because the West Bengal state released huge vacancies in the name of the Assistant Engineer jobs i.e. around 365 vacancies. So the candidates who applied for the AE jobs need to prepare well to achieve their dream job. For the applicants, who are in a confusion that how to start the AE exam preparation, we will suggest you that start the preparation with WBSEDCL Previous Papers. So that you can estimate how the question paper will be in this year. For the Sub Assistant Engineer, there will be a written test, Computer proficiency test, and an interview. So the candidates need to do more hard work in order to enter the next level of the AE recruitment process. With the help of the WBSEDCL AE Previous Papers, you can analyze the level of complexity of the examination. Also, observing the Previous Papers of West Bengal Sub Assistant Engineer exam, you can identify the main topics from which the number of questions appears more. So prepare those main topics from the WBSEDCL Sub Assistant Engineer Previous Papers to score more marks. Also, for your AE Exam preparation, we are giving the complete syllabus for the Assistant Exam. And the exam pattern for the Sub Assistant Engineer written test and computer efficiency test is available on the below table. Hence you can check details like the name of the subjects, duration, no of marks, etc in the exam pattern table. Therefore download the West Bengal AE syllabus and check the exam pattern before starting the preparation. Also, check the official website of the West Bengal Electricity Distribution Company i.e. www.wbsedcl.in for further information about the Sub Assistant Engineer exam.